Poll Logic is a feature which optimizes the respondent’s engagement with your feedback questions. It allows you to remove irrelevant steps from the user journey, reducing friction and keeping the respondent engaged in providing you with pointed feedback. If you have more than one question in your Poll, you’ll have a chance to decide which question your respondent should see next. By default Hotjar will send them to the next question, however, you can choose to send them to a specific follow-up question or send them straight to the end of the Poll based on their answer by selecting a logic option. Next question: This will take the respondent to the next question in numerical order. This is the default behaviour for Poll questions. Specific question: This will take the respondent to a specific question after they answer, regardless of what they answer. Thank you: This will show the respondent the "Thank You" message and end the Poll. Specific question based on answer: This will take the respondent to a specific question based on the answer they have provided. There are several paths through the Poll which differ based on the information which the respondent provides. 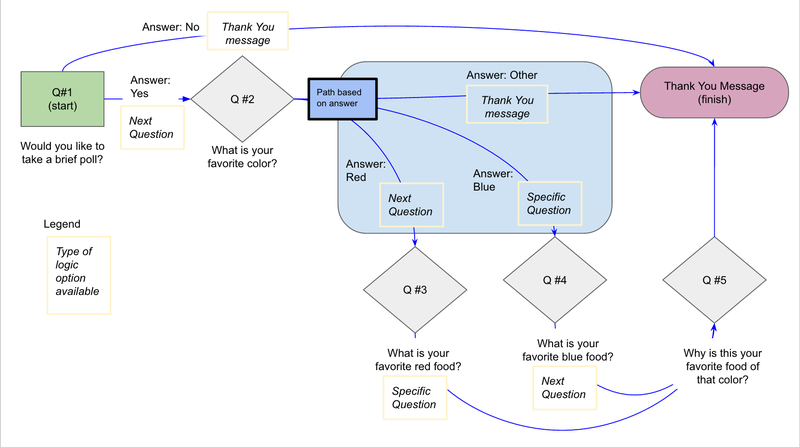 In the example flow chart, the first question screens all respondents against their willingness to participate and directs them into an appropriate branch of the Poll. Why can I only route checkboxes to one question? Checkboxes do not support “Specific question based on answer” because a checkbox question can have more than one answer. If the respondent should only give one answer, you should use radio buttons—and these then allows you to route the respondent based on their answer. Can I use Poll Logic in my Hotjar Survey? At this time, Survey does not offer logic in the way that a Poll does. How can I allow the user to skip a poll question? Ideally the logic you have designed will negate the need to allow respondents to skip questions. We have seen some site owners use an option like "I would rather not say" or “not applicable” in their radio buttons to allow the respondent to move on without leaving a more useful answer.